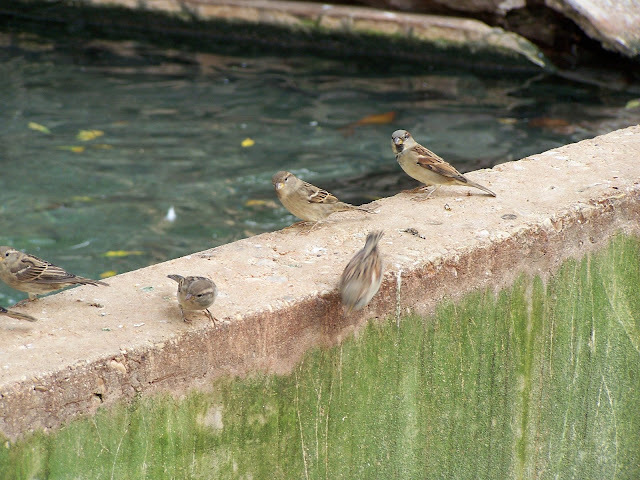 A couple of little birdies told me that San Antonio, Texas was a great place to visit so I thought I would check it out. 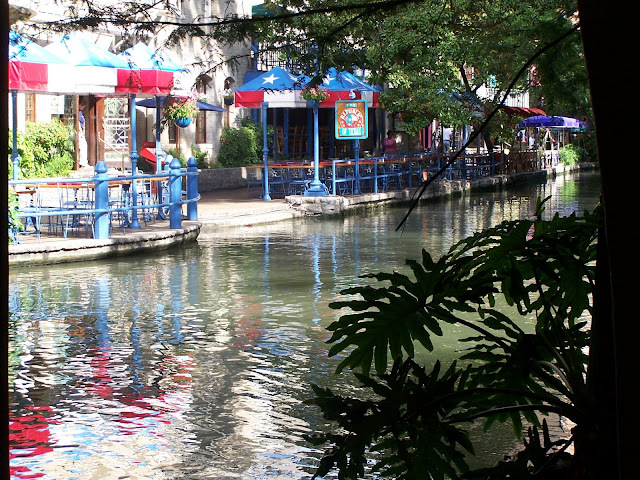 There are some gorgeous hotels in San Antonio some on the River Walk, some out close to Fiesta Texas, & Sea World. 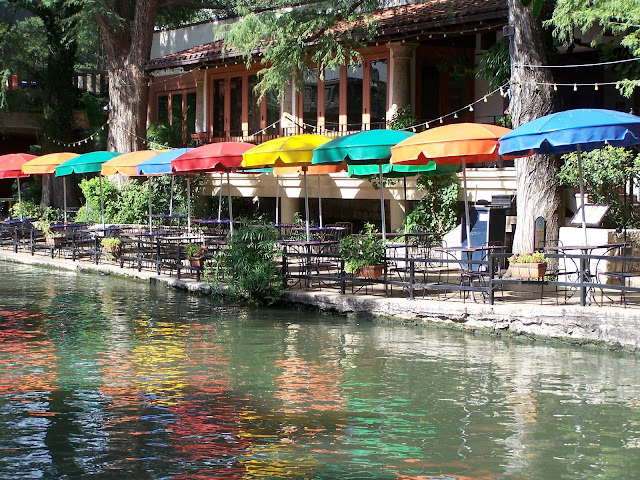 Speaking of the River Walk, it is absolutely gorgeous. There are colors, & flowers & greenery every where. 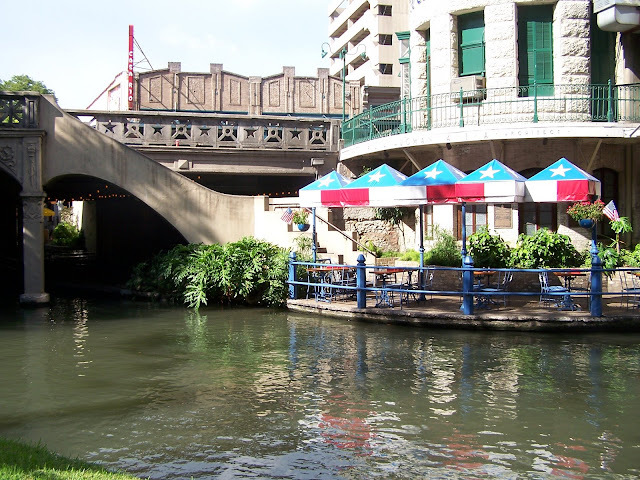 There are bridges over the River Walk all along the way. Each and every one is different and unique. There are really good restaurants along the way. This is a picture of a really good Mexican Restaurant. 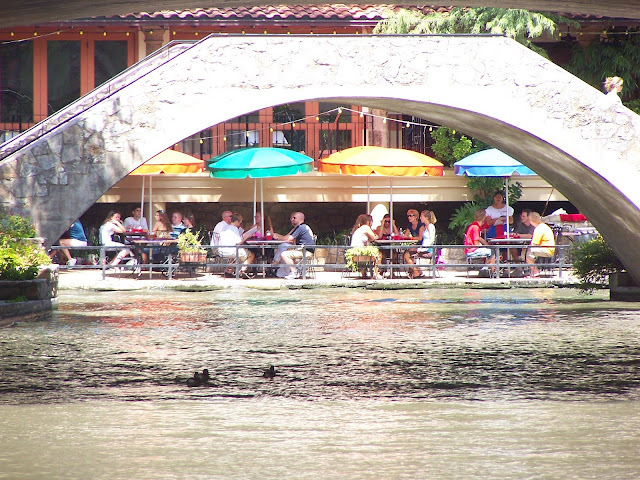 You can eat out on the river or inside the restaurant. Most of the time these tables are jam packed with people. I took this very early in the morning before the restaurant opened, so I was able to catch it looking very serene. 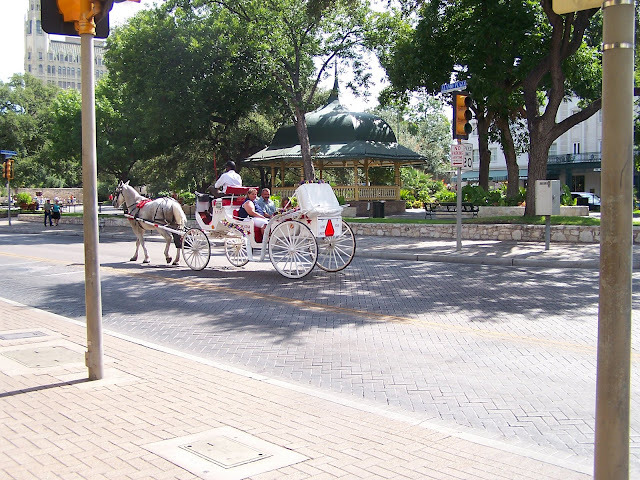 This is a picture of another restaurant that serves Great Texas Cuisine. I just love the way the colors are reflected in the water. 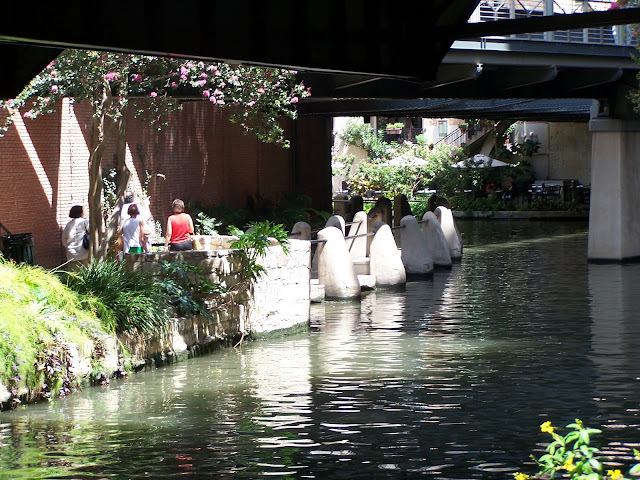 The river walk is never quiet for long. Before long it is jam packed with people. Touring the pathways & bridges & stairs. 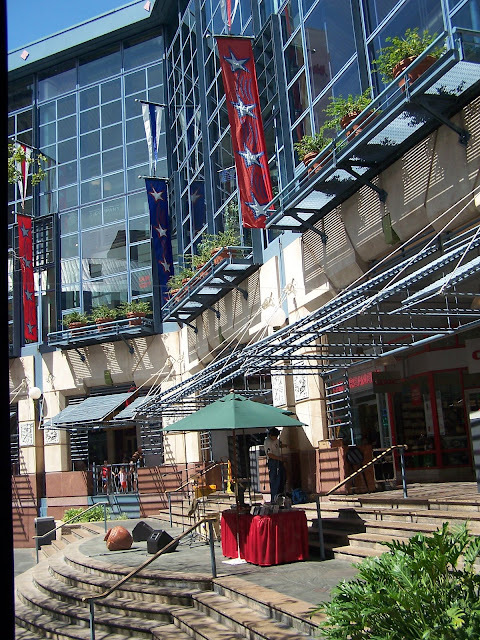 For those of you who cannot negotiate stairs there are elevators that will take you from street level to the River Walk level. 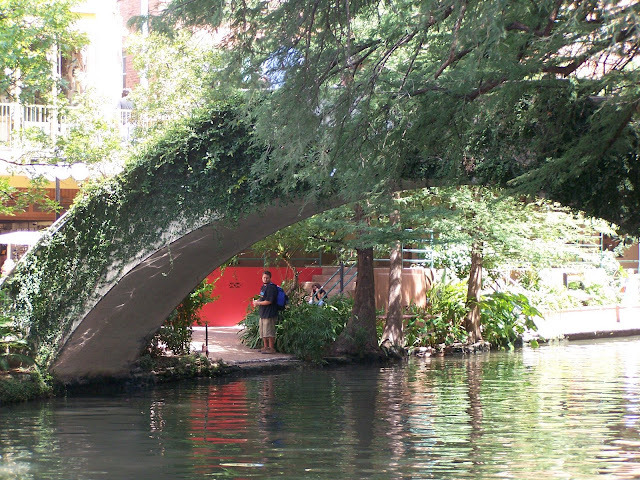 This is another of the beautiful unique bridges that cross the River Walk. They are all so picturesque. It is no wonder that they are a favorite of artists to use in their art. 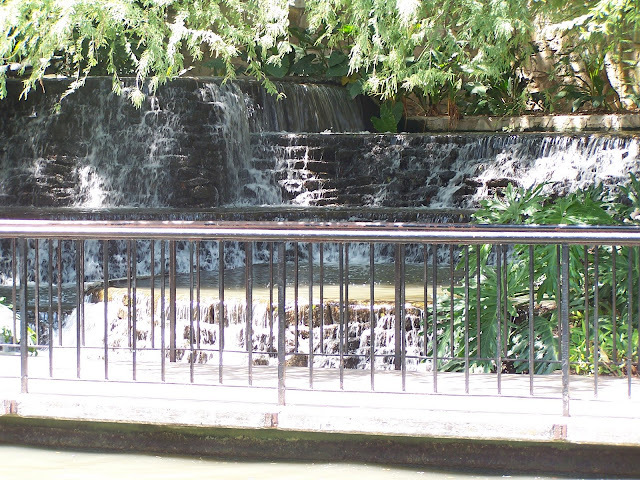 There are beautiful waterfalls, pools & fountains all along the way. The sound of the splashing water really makes you feel cooler when the temperatures are sweltering. 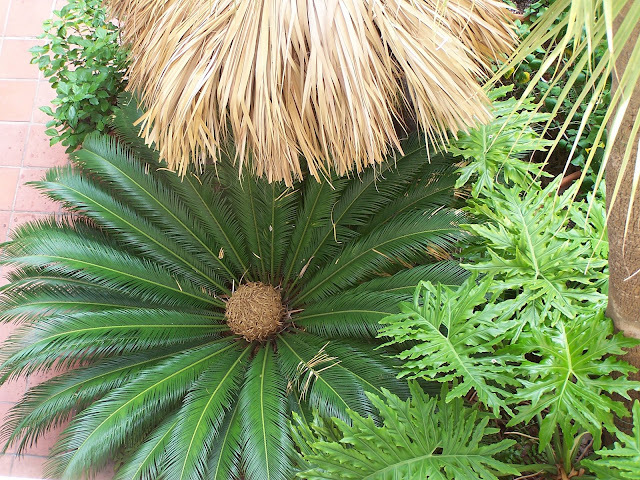 People flock in to see the beautiful lush plantings of flowers, trees, bushes, & palms. There are so many colors of green & beautiful textures to see & experience. 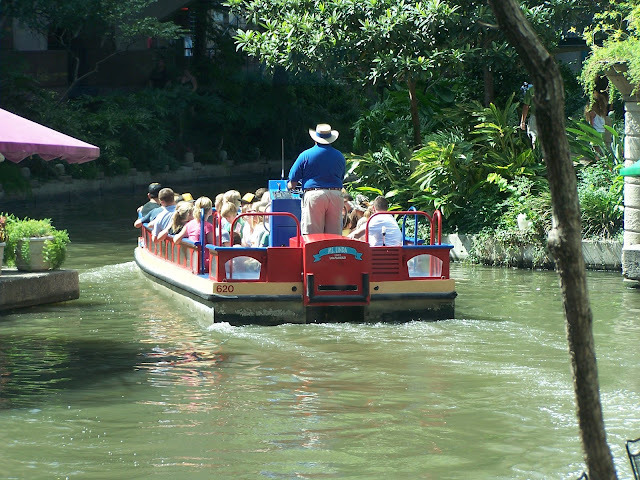 You can tour the river on a river boat with a tour guide. I so enjoyed the tour. 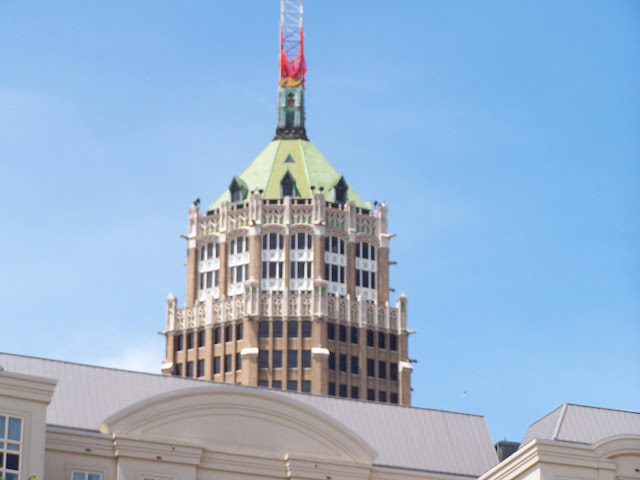 The tour guides are so full of information and history of San Antonio. It was very interesting and fun. The boats are also a good way to rest & cool down. 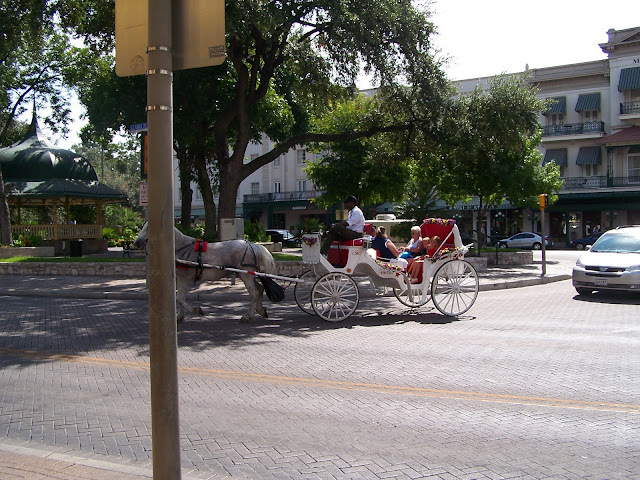 Up at street level in San Antonio you can take a buggy ride. 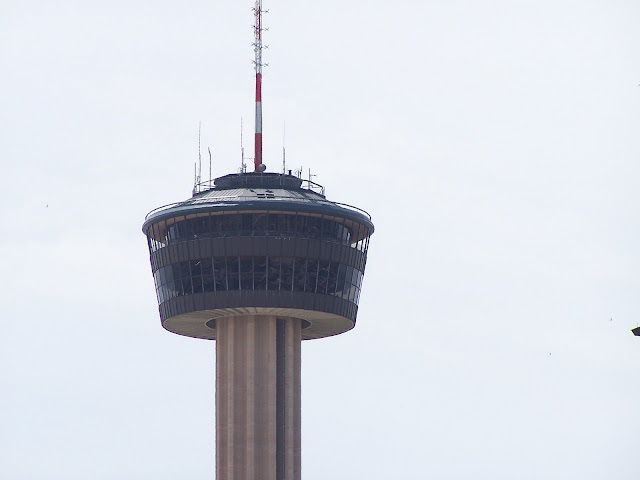 There are so many beautiful things to see in San Antonio. 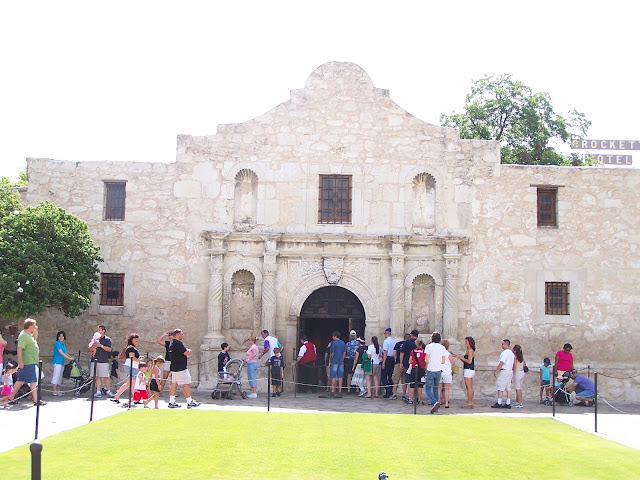 The tour of The Alamo was much more moving than I expected. When I think of the lives that were lost here it stirs my heart in awe. 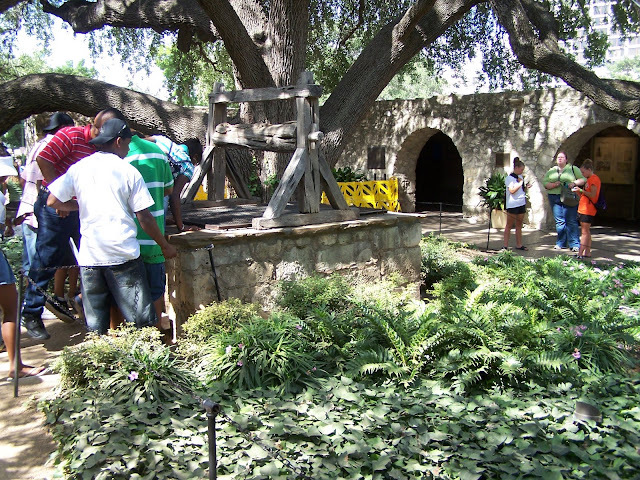 There were many many soldiers lives lost in the building below & this is the well that provided water for the Alamo. It was all much smaller than it seemed in the movie on t.v. 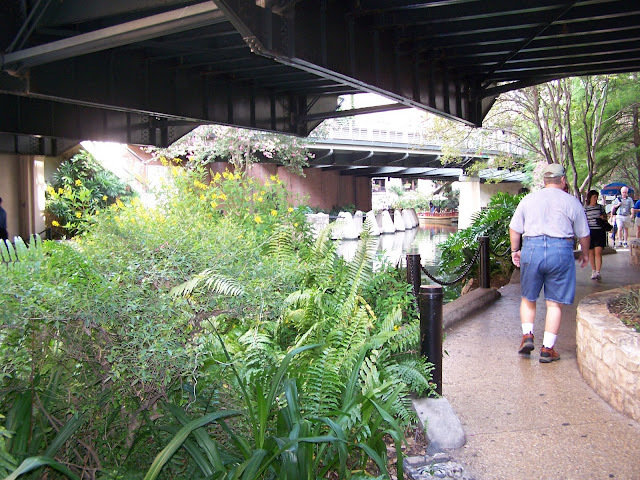 Walking under the bridges is a very welcome respite from the sun. 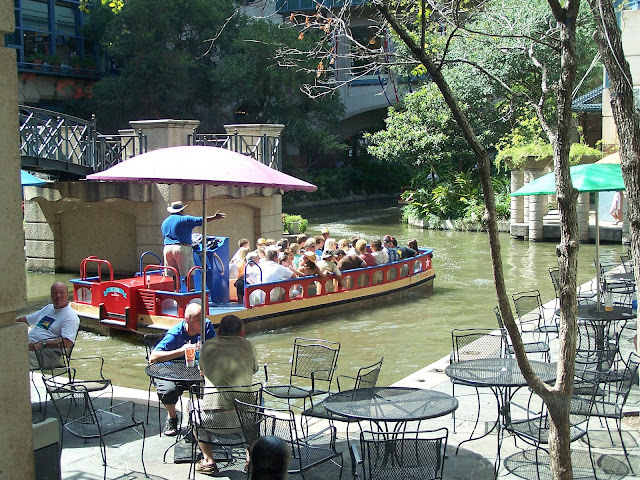 This is a picture of the River Walk Mall which is at the end of the River Walk & across the street from The Alamo & only a short walk from the Alamo Dome. 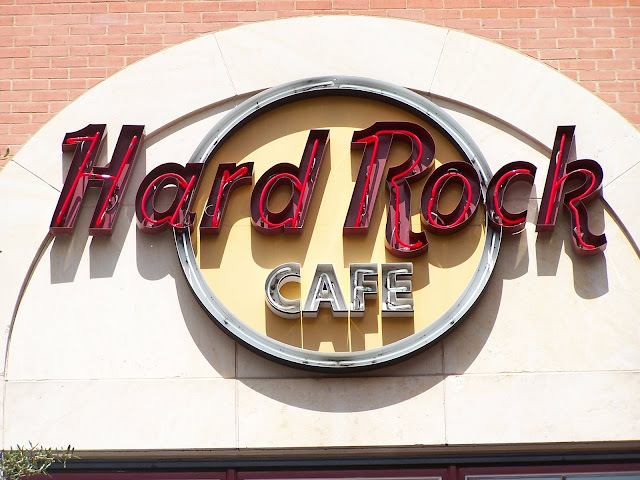 The Hard Rock Cafe is on the River Walk also. It has some really cool architecture. 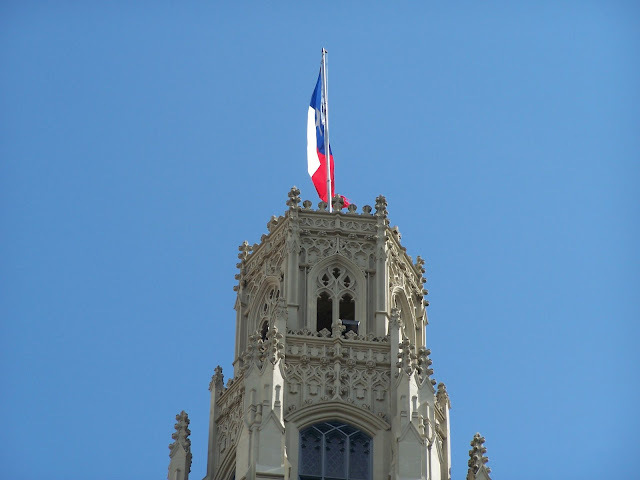 In fact the whole city is filled with great architecture. Some of it is very cutting edge & some of it is very historic. Everywhere you look are beautiful buildings, colors, textures & shapes. It just amazes me every time I visit & I never tire of visiting here. There is even a space needle. 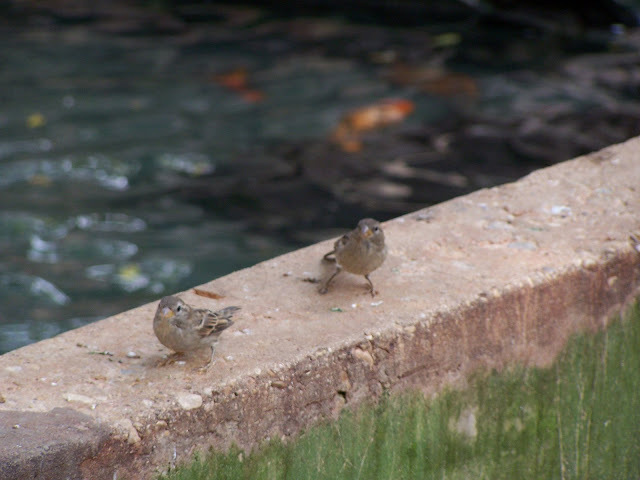 Those little birdies sure did know what they were talking about! 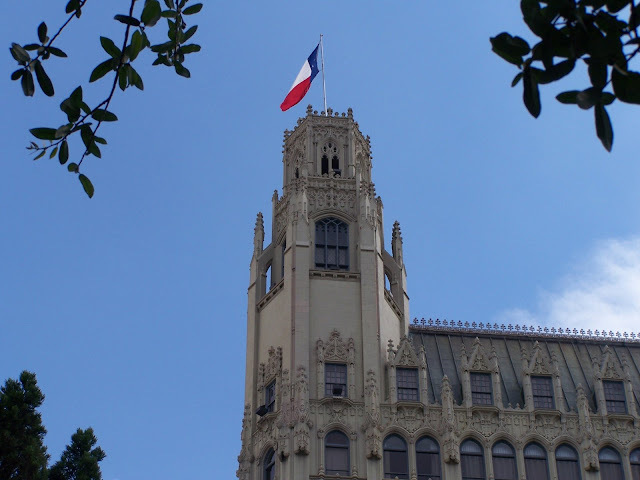 I visited San Antonio once as a young girl and have fond memories of it. 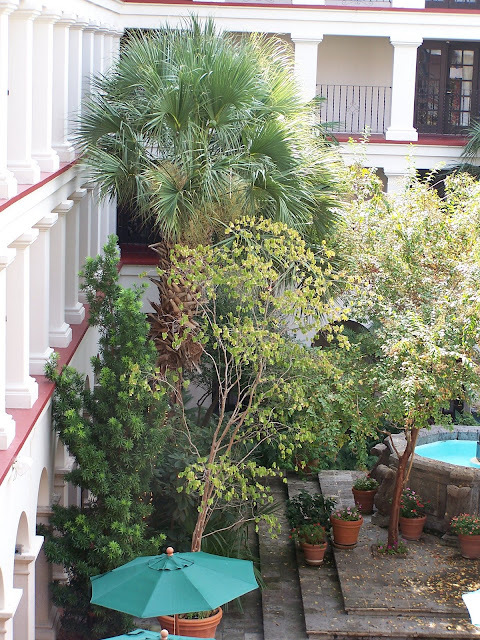 Maybe this should be our next "get-away-weekend" trip. Sweet blog - love the brown/green colors. I've never been there...thanks for the tour...loved it! I saw that "river" thru town on HGTV on a Christmas special. 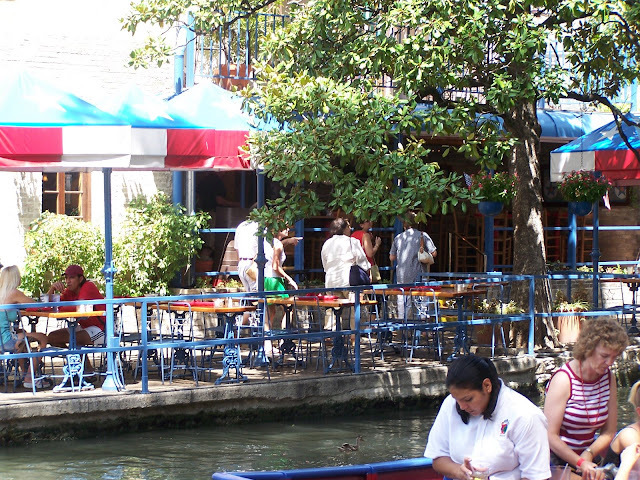 I'd love to eat mexican food there, by the water. 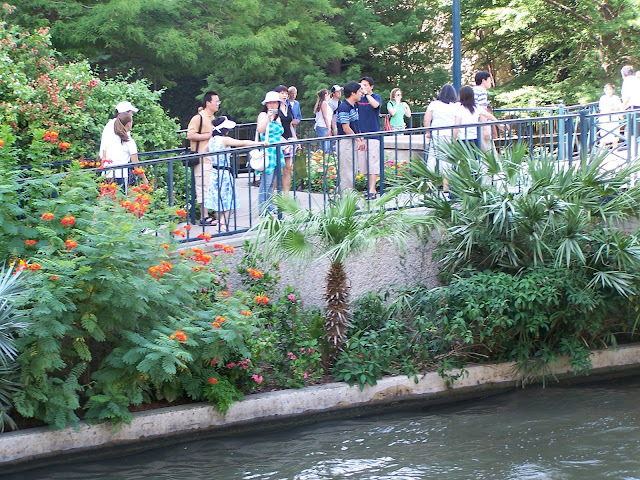 I’m glad to hear you enjoyed your trip; those are some really great pictures of the Riverwalk and San Antonio! 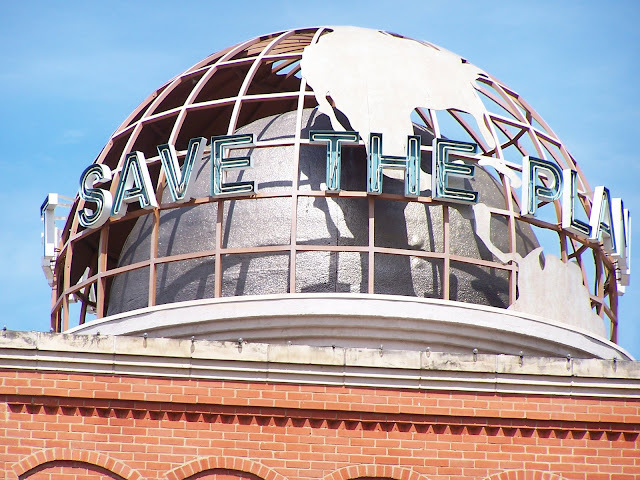 There are so many fascinating, historic hotels in the area that you should be sure to check out next time you are in town; they would make for some really neat photographs.